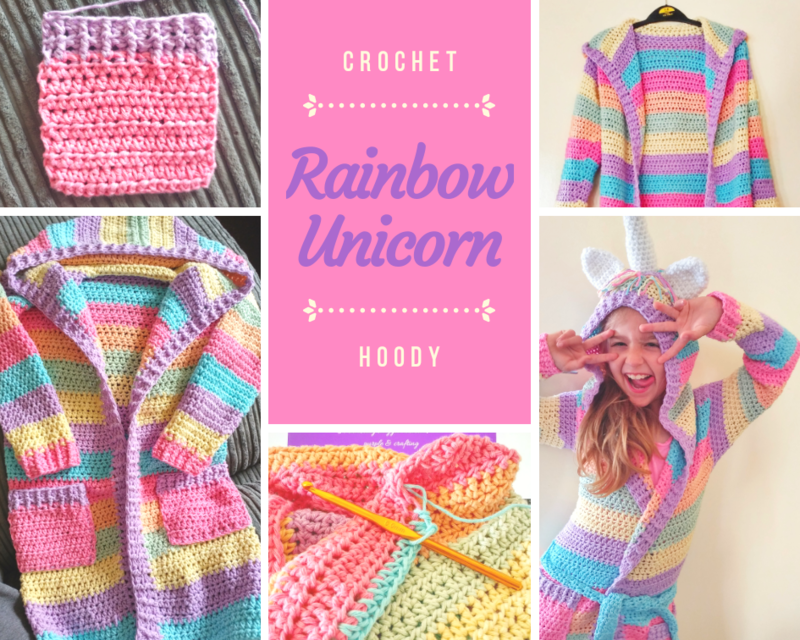 Crochet Rainbow Unicorn Hoody – Complete! Finally, the crochet rainbow unicorn hoody is complete! My second crocheted cardigan so far. They are both pastel rainbow colours but this one is a unicorn hoody with an added belt. I created these using Drops Paris cotton and it is lovely and soft. This has taken way longer than I had hoped. This is due to the fact I had to restart twice, once for sizing issues and again to remove a colour. I was so relieved to finally finish the main body when I realised I had to learn how to FPHDC & BPHDC (front pass and back pass half double crochet, the purple stitches). With the first cardigan I could not figure this out and went with a plain edge but Eva insisted I gave it a go. I finally managed it, pleased to have learnt some new stitches. I need to work on my tension still but I’m pleased with the result. Eva decided she didn’t want an open cardigan or buttons! Instead, she wanted a belt. The pattern I used from Heart, Hook, Home didn’t have a belt so I made one and added loops to the hoody. I then made and added the horn, 2 ears & mane. Eva was extremely pleased with how her crochet rainbow unicorn hoody turned out. Hopefully, if I make another I can improve the horn and ears but Eva is happy enough! It feels awesome to say I’ve completed a few big projects this year including my purple granny square blanket and these two hoodies. I’m now back on the hunt for new projects having completed this. I’ve already made 2 golden snitches & started off a scarf. I have a few cushions I want to make covers for too. Do you know of any cool patterns you think I should try? What do you think of our crochet rainbow unicorn hoody? This is really cute. Is there a pattern for it? You would make my seven year d granddaughter the second most happiest little girl in the world to give her grandma this pattern! What do I need to do to get it! I will love you forever! I used this pattern - https://hearthookhome.com/child-size-unicorn-hoodie-crochet-pattern/ but with the Drops Paris Cotton in pastel colours, I hope your granddaughter loves it!